In the photograph above, taken on Jan. 10th, 2010, you will observe the 14th Dalai Lama, Tenzin Gyatso, administering bivalent oral polio vaccine (bOPV) to an infant at the Mahabodhi Temple Complex in the Indian state of Bihar, Buddhism’s holiest site – the very place where Guatama Buddha is believed to have attained enlightenment approximately 2500 years earlier. 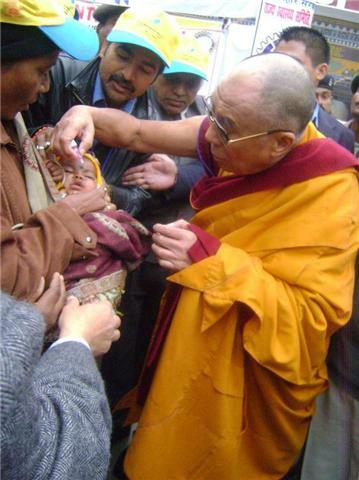 During this globally televised and deeply symbolic event, the Dali Lama vaccinated not one but two infants, ostensibly as an expression of compassion, as well as to lend his visible support for India’s National Immunization Day, and for the larger Global Polio Eradication Initiative, whose duplicities and failures we have covered elsewhere. The concept of doing no harm is fundamental to Buddhist teaching, as it is within other Indian religions (Hinduism, Jainism), and is known as ahimsa, literally “the avoidance of violence – himsa.” One would not, for example, justify killing an animal in order to save one’s own life, which is one reason why many Buddhists are vegetarians. It was the precautionary principle, in fact, that lead the United States Public Health Service and American Academy of Pediatrics to determine that thimerosal (methylmercury) should be removed from vaccines as “a purely precautionary measure,” despite what they said was a lack of convincing evidence of toxicity. By 2001, thimerosal was removed from almost all routine childhood vaccines in the US (it is still found in multi-dose vaccines targeted against flu and tetanus). In other words, the precautionary principle is disregarded in favor of the “weight of evidence” standard, which puts the burden of proving a medical intervention to be unsafe on those who are, or already have been, exposed to potential harm — and often without being made fully aware of the true risks beforehand, which is essential for the medical-ethical principle of informed consent. Moreover, vaccines clearly violate the principle of ahimsa in at least two ways: 1) all vaccines require harm to animal and/or human life (e.g. fetal tissue for diploid vaccines) in order to develop them. 2) All vaccines have serious, and sometimes lethal unintended, adverse health effects — for unequivocal proof of this, view the “side effects” panel on any vaccine insert where the manufacturer is legally required to list them. The question therefore is not whether vaccines will do harm, rather, how many will be harmed and to what extent. In the case of oral polio vaccine, the known risk of polio-vaccine induced paralysis is weighed against the theoretical benefits of the polio vaccine. Contrary to the precautionary principle, the standard is to determine “an acceptable level of harm [himsa]. If only a ‘small percentage’ of infants receiving the vaccine are expected to become paralyzed or die as a result of vaccination, then the vaccine is considered justifiable and will be approved for use. This, of course, violates the Buddhist ethical principle ahimsa discussed above. Even more disturbing is the finding that as many as 47,500 cases of polio-vaccine associated paralysis may have occurred in Indian infants and children in 2011 alone, following the launch of the “new and improved” vaccine. Adding insult to injury, the Global Polio Eradication Initiative claimed that polio was all but eradicated that year and that vaccine-induced cases of polio are exceedingly rare, if not altogether unworthy of mention. Oral polio vaccine was phased out of use in developed countries because of its lack of safety. In fact, oral polio vaccine has been the #1 cause of polio paralysis in developed countries like the US since 1973. [i] The vaccine is associated with a phenomenon known as “reversion,” where the vaccine itself causes polio paralysis, also known as vaccine-associated polio paralysis (VAPP). This is why a more expensive inactivated form (IPV) is now being used in countries that can afford it, and why the more dangerous form continues to be given to the poorer nations who can not afford a non-infectious vaccine. Furthermore, vaccine development, historically, has depended on vast animal cruelty and aborted fetal tissue to produce vaccine antigen. (The GlaxoSmithKline bivalent oral polio vaccine launched by the Dalai Lama, in fact, was “propagated in MRC5 human diploid cells,” according to the WHO Dossier. The MRC5 cell line was derived from the lung tissue of a 14-week old male fetus by J.P Jacobs in 1966). We can assume that the Dalai Lama is not familiar with these facts, and is simply trusting the official position statements concerning vaccine safety and effectiveness put out by organizations like the Global Polio Eradication Initiative, which he has allowed himself – by accident or intention — to become an official emblem of. See photo on their website here. Do not believe anything simply because you have heard it. Do not believe in anything simply because it is spoken and rumored by many…Do not believe anything merely on the authority of your teachers and elders…But after observation and analysis, when you find that anything agrees with reason and is conducive to the good and benefit of one and all, then accept it and live up to it. 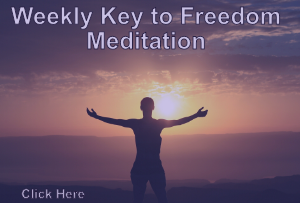 The Buddhist scriptures actually reinforce the perspective that you simply can’t vaccinate people out of poverty, environmental chemical exposures or suboptimal nutrition. For example, according to the Medicine Buddha Sutra, two of the 12 fundamental vows of the Medicine Buddha, known as Sangay Menla in Tibetan tradition, are #3: “To provide the sentient beings with whatever material needs they require” and #11 “To relieve those who suffer from terrible hunger and thirst.” In other words, hungry folks need food, homeless folks need shelter, in order to be healthy. The Dalai Lama, of course, has created controversy for his penchant for veal, and his belief that abortion may be appropriate if the unborn baby is ascertained to be determined to be “retarded.” So, given his characteristically non-Buddhist beliefs, his support of vaccination is not all that surprising. It is, however, none the less disturbing. The problem, of course, with the argument that Science trumps Buddhist morality (or any non-violent moral tradition), is that vaccinology is more pseudo-science than science. There is, for instance, a shocking lack of scientific evidence supporting the safety and effectiveness of flu vaccines — and this, according to the Cochrane Collaboration’s many meta-analyses on the subject. And yet, the WHO, the CDC, and myriad governmental health agencies around the world spout an endless stream of pseudo-scientific propaganda to the contrary. Even basic tenets, such as the antibody-based theory of vaccine-induced immunity have been called in to question, if not altogether disproved. Also, there is a growing body of research indicating that routine vaccines can cause well over 200 different adverse effects, including death. This is the science, mind you, speaking — not opinion, or mere belief. Have you sent it to him? No point in doing that, he is fully aware of what he is doing. He is unfortunately compromised just like many other prominent figures out there. May the people of the world have eyes to see and ears to hear and a heart that is clear to feel what is right. Very disappointing to see the Dalai Lama captured by vaccine dogma. I would have thought that he, of all people, would be wiser than this.